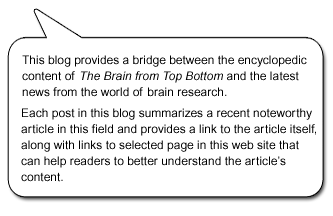 While I’m doing research on the various subjects that I write about in The Brain from Top to Bottom, I often come across interesting articles on other subjects that I’ve already dealt with elsewhere on the site. Whenever that happens, I save a link to the article, planning to embed it as a Link module on the appropriate page of the site. The problem is that I accumulate links faster than I can put them where they belong, so I end up with a file full of interesting links that none of my readers can access. To solve this problem, I’ve decided that from time to time, I’ll make a blog post containing all the links that I’ve accumulated about one of the topics on the site. To start with, this week I’m giving you links to 13 articles related to the sub-topic “Anatomy by Level of Organization” under the main topic “From the Simple to the Complex” on this site. These articles present some basic concepts regarding each of the levels of organization. I also provide a brief description of each article. In this online video, Quebec neuropharmacologist Louis-Éric Trudeau takes you into his laboratory and introduces you to his research area, at the crossroads between neuroscience and pharmacology. Some interesting facts and speculation about the relationship between the number of neurons and the complexity of behaviour. Five experts from France’s National Centre for Scientific Research explain some recent discoveries, about subjects including neurogenesis and glial cells. Instant Expert : The Human Brain An overview of the human brain, with numerous hyperlinks. AWikipedia entry that provides a quick introduction to the various lobes in the mammalian brain. Brief, nicely designed animated tests to see how much you know about the nervous system. An animation on the brain structures associated with various human faculties. A case history of anterograde amnesia, similar to that of patient H.M., discussed in another post in this blog. High-resolution images of actual sections of human brains, where you can zoom in on details at will. How the genetic predispositions behind dangerous behaviours can be modified through learning. The implications of social-network analysis for research on the social psychology of human behaviour. How our genes influence our relationships with other people and how these social behaviours change our biology. American conservatives appear to be more inclined to break their country’s moral rules than Americans who are more liberal.